Ships free in 2-3 business days per UPS Worldwide express, well packed and fully insured. 15 inch 8 day chalet with many moving features. Turning dancing couples in traditional Black Forest attire. Moving waterwheel & and bavarian beerdrinkers in traditional bavarian Lederhosen and Trachten hat.Many decorative details. Clock features roof with over 100 handcut and handlaid wooden shingles. Lasercut windows and red shutters, even the window treatments are wooden.Wooden hands, dial and cuckoo bird. Big bellows create deep cuckoo call. The Hekas brand was started by Helmut Kammerer in 1938. Now the 3rd generation of clockmakers is still making these intricate timepieces at their factory in Schonach, Germany in the Black Forest region. 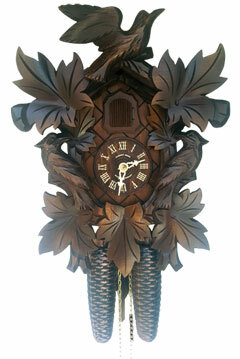 Hekas makes all the clock cases in their own carpeter shop and all carvings are handmade by local carving artists. 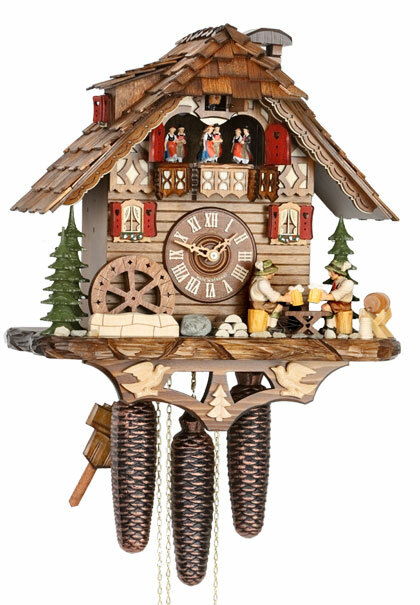 All Hekas cuckoo clocks are still handmade in the Black Forest, show great attention to detail and are carefully tested before they ship out.